Last week, Christian Science Monitor's Stacy Teicher Khadaroo wrote about how New Hampshire teachers have developed new ways to measure deeper learning. 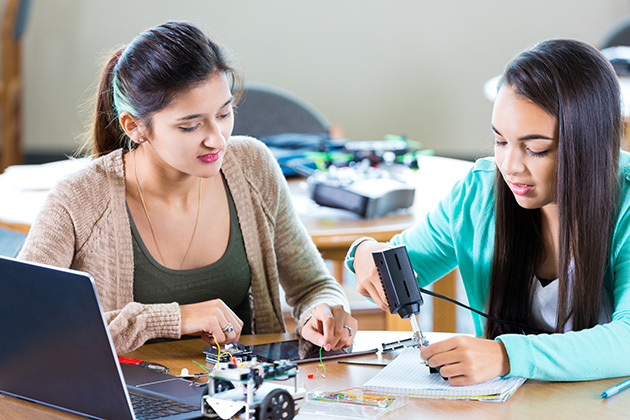 In her article, Khadaroo highlighted schools like Concord High School that have students simulating real-world experiences through enriching learning experiences. Known as performance tasks, these experiences become both the teaching and the testing at both the local and state level. "Just outside Concord High School, a delivery truck has spilled its chemical supplies. The students' mission: Investigate the properties of the spill and develop a detailed plan to clean it up safely," Khadaroo wrote. "Teenagers wearing safety goggles squat down, sucking up samples of the clear liquid with pipettes. "The simulated spill has been 'contained' in a fish tank. But the students play along, first by developing some 'testable questions' with their partners: How acidic is it? How does it compare with the properties of each substance on the truck? They'll have four class periods over the course of several days to collect and record data with assigned partners, and to write up, individually, their plans." As Khadaroo explained, "for more than a decade, schools in the Granite State have been transitioning to competency-based education, in which students are asked to demonstrate mastery of essential skills rather than simply spend a certain amount of time in class and get a minimum passing grade. The focus is on the kinds of skills — analysis, reflection, creativity, and strategic thinking — today's students will need in order to thrive in an unpredictable world." In this MultiBriefs Exclusive from December of 2014, I first wrote about New Hampshire's efforts to implement the nation's first alternative to standardized testing accountability models. According to its website, the NH Department of Education model, known as Performance Assessment of Competency Education, or PACE for short, "provides districts with an alternative route of demonstrating measurable progress in student outcomes in the New Hampshire competencies, the Work-Study Practices, and other important measures. It enables districts to emphasize meaningful content, high quality instruction, and deep student engagement." With PACE, teachers in NH schools collaborate to design, implement, assess and refine the performance tasks that are used at various grade levels in math, science and ELA in the PACE program. Performance assessments are not new in New Hampshire. In fact, they have provided a backbone for a statewide effort to move schools to a competency-based learning model for over a decade. According to the Center for Collaborative Education (CCE), in their publication "Quality Performance Assessment: A Guide for Schools and Districts," performance assessments are "multistep assignments with clear criteria, expectations and processes that measure how well a student transfers knowledge and applies complex skills to create or refine an original product." CCE has been partnering with the New Hampshire Department of Education and several PACE schools for years to develop and refine performance tasks that have been implemented in classrooms around the state. In April of 2017, Pam Wicks — a Concord, NH, school board member and mother of three children — spoke in strong support of the PACE program to the NH State Board of Education. Wicks' comments were captured in this recent Reaching Higher NH blog article. She spoke passionately about her fourth-grade son, David, was excited to be working on a solar cooker project at school. "Mom!" he said. "I need a pizza box, duct tape and some aluminum foil, it's for my science test, we're going to be building a solar cooker and I want to practice." It took Wicks a few minutes to realize David wasn't working on just any ordinary project, he was doing his PACE assessment for fourth-grade science, an alternative to a more traditional multiple choice standardized test. "The fact that he didn't even realize the solar cooker was a statewide assessment is not only a testament to the school, for not making a big deal about the testing, but a testament to PACE itself," she explained to the board. "He wasn’t just sitting in front of a computer for two hours plugging in answers to mundane questions. He was going to have to build something using and applying what he had learned in his unit on energy. "It was fun and hands on — certainly more engaging than answering questions on a piece of paper. With PACE there is an appreciation for what they are learning and the process of showing it." Early indications suggest PACE is having a positive impact on closing the achievement gap. For example, in this Reaching Higher NH article, University of New Hampshire doctoral candidate Carla Evans discovered that PACE students with IEPs do better in eighth grade math than they had before. Evans elaborated on this finding for Khadaroo's article. "Her (Evans') analysis of eighth-grade students' math scores on Smarter Balanced found that in the second year of the pilot, PACE students outperformed those in non-PACE districts, on average," Khadaroo wrote. "For students with disabilities, the difference was even stronger." There is no doubt that performance tasks provide students with better, more enriching learning experiences. Through such efforts, tests become the teaching, and the teaching becomes the tests. Students are able to engage in deeper learning, which strengthens their ability to apply and extend their learning to new situations and ideas. New Hampshire's efforts make it easier for this type of learning to become the new standard in classrooms across the country.